Welcome here. 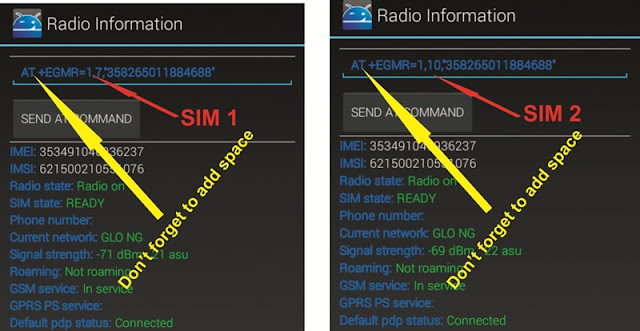 If you plan using this tweak on your android phone to enjoy bis subscription fron Glo NG, this is just part two of the steps required. 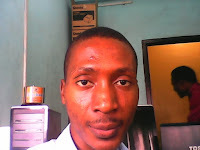 Make sure you read my post where I explained: how to generate blackberry imei before continuing. First, download MTK Engineering mode app here on your android phone. Then install it on your android phone. Don't forget to first allow installation from unknown sources. NB: If the option isn't available or you get an errpr message that 'Engineer mode app is not found', then your phone is not supported becauce the processor is not built by MTK. Swipe the screen left to 'Connnectivity' tab OR scroll the page down and select 'Connectivity' as applicable to the android version you use. If sim 1, type AT+ EMGR=1,7,"_new imei_number"
but if sim 2, type AT+ EMGR=1,10,"_new imei number"
Finally, Click 'Send AT Command'. You should get a message below the screen that it is successful. Restart your phone OR turn on Airoplane mode and turn it back off again. Voila!!!! There you have your new imei changed.